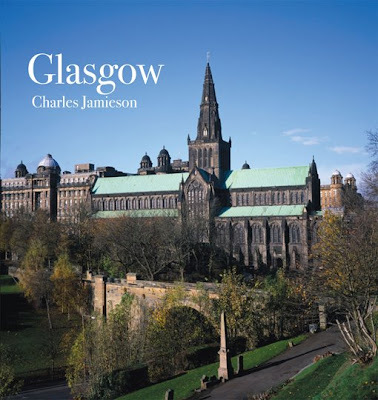 Last week may have been dominated by The Aspect Prize but this week my world has been taken over by the launch of my book of photographs of Glasgow which comes out on Thursday. It's a very strange feeling. Quite surreal really. I've never done a book before and in some ways it feels as though it's all happening at a distance. After all it took three years to put together and it's many months since I stopped working on it. Let's see how it settles out there in the world of bookshops. These are some views of the Aspect Prize Finalists Exhibition in The Gallery in Cork Street, London W1. So where have I been all week....no laptop to hand. No blog forthcoming? OK well folks I've been in the Metropolis, downtown Londinium, overseeing the annual finalists exhibition of The Aspect Prize in Cork Street behind the Royal Academy. We had four finalists...Janet Melrose, Rory McLauchlan, Toby Messenger and Alistair Pender. Alistair won and received a cheque for £10000. How nice is that. Of course the telephone went crazy with journalists and one managed to call my mobile whilst I was in the toilet....is there no privacy! This is the tiling outside the door of the National Gallery in Trafalgar Square. Had dinner in the fabulous Ali Baba restaurant in Ivor Place last night. Lovely Egyptian food. Charlotte lent me her laptop to do this...so much better than an internet cafe. Last night's opening at the Maclaurin Art Galleries in Rozelle Park, Ayr of the 101 Invited Artists Exhibition. The exhibition runs until Sunday April 19th. It's a beautiful place and well worth a visit. What's more, there is a splendid tea room. This is my painting. That's better. OK, this is me in Rome in 19...... I'm not telling. I know it's another daffodil but it's Spring and I like daffodils... and it's my blog. 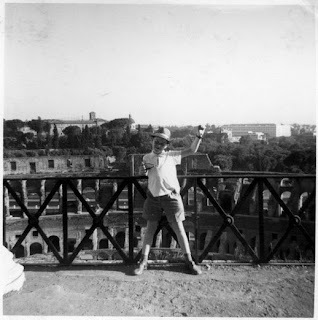 Actually, I wanted to upload a picture of me as a youngster in Rome wearing a Frank Sinatra hat but the uploading system seemed to be defeated by the image several times. Another nice day out there. 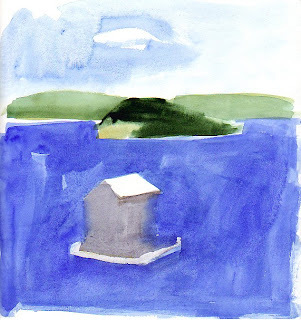 Hi, this is a wee watercolour sketch I did in Maine of a floating lobster fisherman's hut. Very serene little corner just off Deer Island. Quite like it. Might frame it. Well, managed to fix the photo problem. Not at all sure how I managed to get the problem in the first place. At least it's fixed. For some reason I can't access my photos any more so the two below might be the last for a while, or indeed ever if I can't get to the bottom of this. I might even have to start a new blog altogether. Anyway below is the Maclaurin Gallery where the 101 Scottish Artists exhibition is being held. Wanted to chat a bit about it but am feeling decidedly grumpy now that I can't load any more photos onto the blog. Good morning. Lovely day. 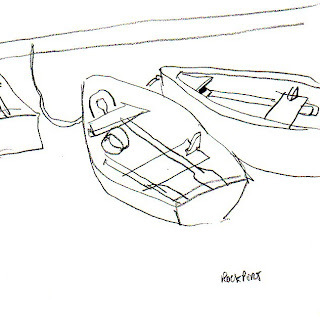 Here's a wee drawing I did of some boats over in Maine. Somehow they look better on screen than they do as pencil on paper. Ah well.... a world of possibilities. Off to Ayr to put two paintings into an exhibition of 101 Scottish Artists which is part of the Scottish Homecoming celebration. Nice day to go driving. Think I'll take my camera. After that I'll have to focus and get myself back to the easel and paint. Time for a painting. Sold this one a couple of weeks ago. Great fun to paint. Looser and more colourful than the images I usually go for, it is one of a number of paintings that are fun to put together and seem to have a following. 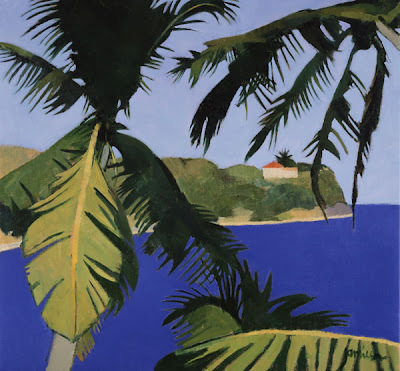 The psychology of painting vastly different images is pretty simple. 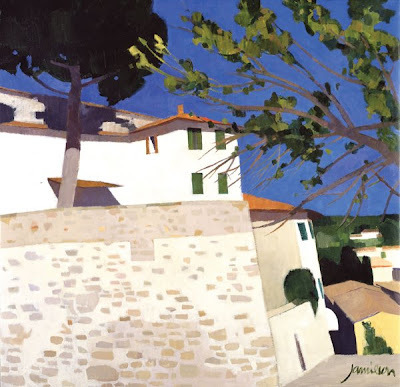 Some people say...'but your painting in a different style!' As if that's a problem. Anyway, I always say never confuse style with repetition. There was this other follower who turns out to be some deeply questionable advertising thing that must latch onto blogs the world over. When you click on it you find yourself looking at an advert for a four wheel drive vehicle. Hmmmm. Not far from where I live a local farm where they make fabulous cheese have opened a tea shop come selling counter for their wares. It's on the road between Dunlop and Stewarton. Worth a visit. Great for lunch. On the walls are works of art by various local artists and soon there will works from Glasgow artists so the standard is pretty good. Had cake and tea there yesterday before going home to make supper for some friends. Managed not to do any work. Thought about it. Stuck a newly framed painting on the wall. Showed pals some other new ones but did not pick up a brush. That can wait until tomorrow. In 'The Pictures' in Glasgow where I have my paintings photographed, you can see John framing a fabulous reproduction print they have made of one of Alistair Penders great Pop Art paintings. 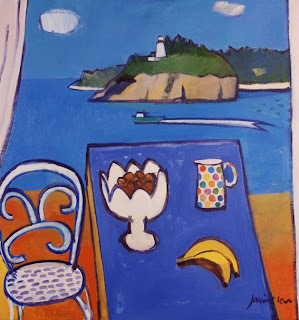 Alistair's paintings and prints can be seen along with work by Janet Melrose, Rory McLauchlan and Toby Messenger from March 23rd to 26th in The Gallery in Cork Street in London. They are the finalists in this years Aspect Prize. I'll be there, popping in and out of the gallery. However, it's Saturday today and we have friends coming round for dinner so I'm going to have to think about what to cook. Importantly, the champagne is in the fridge. In the picture below, Ken of 'The Pictures' is hiding behind a towel. Yesterday was a good day. It was my birthday and we had our first daffodil of the season. Spent some time hanging Sue Biazotti prints in the Village Hall where they are on display for just over a week and look great. Also had a meeting with the musicians who are doing a blues night for us in June. Should be good. In amongst it all I even managed to work on a painting. Root canal treatment was never my favourite dental procedure but I survived. More importantly, last night's full moon brought with it much activity in our wee ponds and this morning we have our first frog spawn. I'd show you yesterday's painting but it's rubbish so I'm going to paint over it. No point in pursuing something that has already gone downhill. This is Sue Biazotti's work table. Told you she was working in red. Huge red paintings, small red paintings and in between red paintings. A massive expression of feeling. Well worth seeing. at the moment. I'll get an image up in a day or two. Have to go to the dentist today for something ghastly. I'll lie there and think about painting. Just noticed that painting contains the word pain. Think I'll concentrate on something else. Typical mess in my studio. So little room there that everything piles up. Visited Sue Biazotti (fab painter) yesterday in her studio and she was doing red paintings so everything was red. Took a couple of paintings to the photographer and as ever they look so different when you get them out of the studio. It's as if they decide to become something else and gain a life of their own. We had snow this morning but it wasn't as good as this snow a couple of weeks ago. Hi again...not that anyone is reading this, at least not yet. It's the last day of my exhibition. Had several last minute or nearly last minute sales yesterday. Today would be last minute....yeh I know but sometimes a little dramatic license is called for in life. The Mayfair Gallery (Panter & Hall)who helped promote this show are keeping the unsold paintings for a couple of weeks to see if there is anyone out there who meant to pop along but didn't have time, forgot or whatever. "I wanted to go but I got stuck in a lift for two weeks after the bank collapsed and you can read all about my miraculous survival in the Daily Watsit this weekend"
In the meantime I paint and paint and all sorts are coming out. And then there is life to be lived...dinner parties, weather...all manner of things. Later. I'm coming to the end of my latest solo exhibition in London which was at The Lennox Gallery. The two pictures below are in the show. I'm also in a couple of Scottish Exhibitions in London… one at The Oakham Gallery and the other at Thompson's Marylebone. A new exhibition opened this week in Richmond at The Richmond Hill Gallery and I had one painting in which sold immediately. They want more. Looks like I'm going to spend my week juggling what goes where. 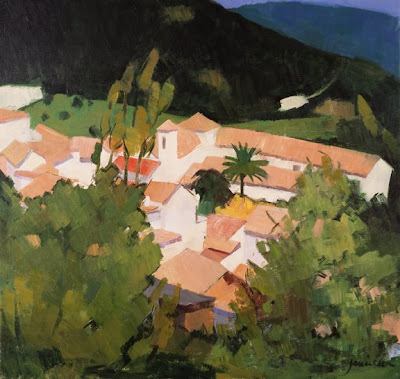 Even more exciting is opening in an exhibition in the Algarve. I'll have to go out there this summer and explore. The big question is...will anyone ever see this blog?